Your family is in for a treat with this best grilled hamburger recipe. An equal amount of pork gives it a delightful flavor, and with the spices and delicious slab of tomato, they will be anticipating the next time it is going to be served. Choose a beautiful day, open a bag of chips, pour the lemonade, and enjoy this recipe. Preheat the grill to Medium-High. Oil the rack before grilling. Combine the onion, bacon, and garlic in a medium skillet over medium heat. Cook until the bacon is crispy and the onion is soft. Drain and put into a large mixing bowl. Add the breadcrumbs, water, salt, egg, parsley, black pepper, marjoram, and paprika. Add the beef and pork by crumbling it into the bowl. Mix everything together well. Make eight patties, about 3/4 inches thick. Grill them for 5 minutes on one side. Flip over and grill for an additional 5 minutes. The center temperature should be no less than 160 degrees. Cook an additional few minutes, if needed. 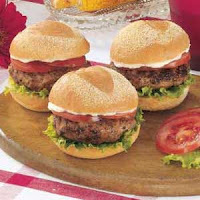 Place each burger on a bun and serve them with the mayonnaise, tomato, and lettuce. Some days are perfect for grilling. 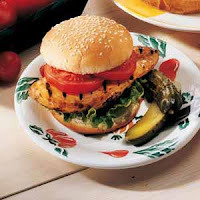 If you are not certain what you want, why not try the chicken grill burger? You have a choice of grilling or sautéing the onion. Just put a small skillet over the grill, rather than using the stove, if your grill is set up for that. Some of the sides that go well with this burger are baked beans, corn, and coleslaw. If you enjoy this sandwich, please drop by and enjoy some of the other recipes. They are easy to make and delicious to eat. Preheat the grill to medium. Oil the rack with olive oil before grilling the chicken. Place the chicken breasts between wax paper and pound them to 1/4 inch thickness. Grill the chicken for 7 minutes on each side. It should be golden when done. Put the butter and onion slices in a small skillet, Sauté for 5 minutes. Remove them from the pan. Toast the split burger buns on the grill. When done, put some steak sauce on each. Add a cooked chicken breast half, slice of tomato, and two slices of red onion to the bottom half of each bun. Spread the mayonnaise on the top half of the bun. Close and serve hot.